The Howler monkeys wake us early with their screams. We are happy for the wake up call, though a volume control would be nice. Our lodging at the Ceiba tree resort includes breakfast and happily we make our way to the dining room. We opt to eat al fresco, enjoy the morning breeze, view of Lake Arenal and the amazing Ceiba Tree. 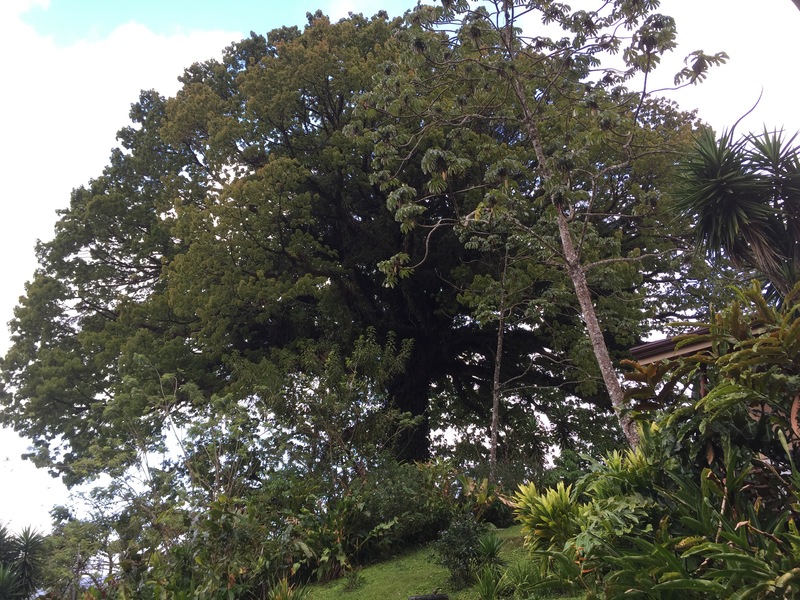 The tree is over 500 years old. I sip my coffee and imagine what it has seen. I can imagine people in various attire marching through the timeline enjoying its shelter and all the animals that have called it home. We speak to fellow Canadians at breakfast. One man asks what we thought of the drive, it’s clear his opinion as we detect a twitch. His wife is not ashamed to say she was car sick. We sit a little straighter, perhaps we are doing okay. We learn the mountain traverse last night was not necessary and that the roads are smooth. The map app cost us an extra tortuous 60km. We hate her and are happy to ignore her for part of the way back. John is interested in a Canopy tour, a chance to zip through the jungle like Tarzan. Wanting to be his Jane, I nervously agree. We begin our drive and stop at a shop to inquire about the tour. We learn it is mere meters away. We arrive, park in an impossibly large parking lot, pay for the tour and browse the over priced gift store chock full of tchotchkes. No knickknacks needed, we browse our way through. We find a beautiful lodge and enjoy a leisurely coffee. It is a beautiful place with its manicured plants and sanitized experience. How different from the more authentic experience we have been enjoying, less North American, more Costa Rican. I’m ashamed at the excess that seems to be required in places like this one and happy for our rental in the mountains. We complete the paperwork for the tour supplying our passport information and blood type. We agree we understand emergency services may take time. We are then fitted with our gear for the Canopy adventure and my heart beats a little faster. A young family arrives with a young girl of 4 years. She declares it is her first time, I admit it is mine too. We both resolve to not be afraid. We receive an in service and soon just like Tarzan and Jane, John and I are zipping from tree to tree through the jungle. The perspective unique as we see the trees from our perch then fly over with a birds eye view. Eleven trees later we arrive at the terminus. Our ride back is an open air affair pulled by a tractor up steep inclines and impossibly narrow roads, equally exciting it is our bonus tour. We change gear and soak our tired muscles in a series of natural hot springs rich in minerals. Each spring progressively cooler as we descend. 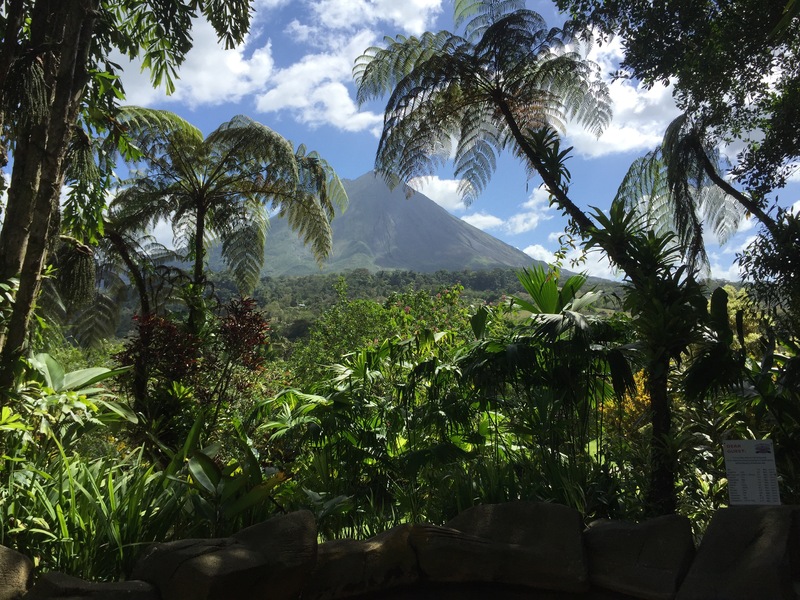 The view of Volcan Arenal breathtaking with its frame of lacy palm fronds. A worker directs our sight to a Sloth in the tree. We watch him for a time, he scratches and like fireworks we ooh and ahh at the movement. We have enjoyed our time at this resort and reluctantly begin the long trek back to our lodging. We comfort ourself with the knowledge that without the unnecessary extra mountain we have only 110km to travel. We allow 4 hours for the journey. Every minute is required as we discover rush hour has waited for us. I’m toughening up as I no longer feel the need to cry, bite my nails or grip the dash. We crawl through the final hour. The map app throws up her hands once more as she directs us in a marionette circle. We are on to her though, allowing her to yip out directions in the background while we use our memory and find our way to our lodging in the dark. It occurs to us that the GPS signal is likely being lost in the mountains and that perhaps the map app is not out to get us as we feared. In any case, today we have enjoyed the journey, the car ride part of the adventure though not the entire story.